Bruce Braden Peel was born November 11, 1916 on a homestead near Ferland, in southern Saskatchewan, and grew up on the prairie. He earned a teacher's credential and in 1937 began teaching school in rural Saskatchewan, and later in Saskatoon. But he had ambitions which required more education, which the Depression and the outbreak of war served to delay. Although unfit for military service because of his eyes, he nonetheless volunteered, and ended up painting ships at the Lakehead. After returning to Saskatchewan, he took both bachelor's and master's degrees in history, then went east to earn a library degree at the University of Toronto. Returning to the University of Saskatchewan in 1946, he was appointed curator of the Adam Shortt Collection of Canadiana. In 1951 he moved, with his new bride, Margaret, to the University of Alberta Library as chief cataloguer, rose to the position of deputy librarian, and in 1955 was appointed "Librarian to the University" – a distinctive title of which he was proud. Later offers from Toronto, McGill, and Western Ontario he politely declined, according to Margaret Peel, because of his unwillingness to leave his beloved prairies. As a library administrator, he guided the growth of the University of Alberta Library from a very modest size to its present rank, as one of Canada's three largest research libraries; planned and developed six library facilities on the Edmonton campus (including the Cameron and Rutherford libraries) as well as the original library collection of the University of Calgary, which was a "branch plant" campus of the UofA until 1965. He served on seemingly endless library committees and boards, and was president of the Library Association of Alberta (LAA), the Canadian Library Association (CLA), and the Canadian Association of Research Libraries (CARL). 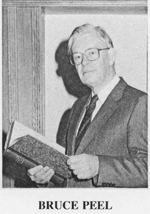 In 1982, the year of his retirement, he was honored with the Canadian Library Association's Award for Outstanding Service to Librarianship, and later, in 1991, by an honorary doctorate conferred by the University of Alberta. He was instrumental in the creation of both the University of Alberta's library school and its press, and a member of the seminal Symons Commission on Canadian Studies (1976-81), for which he drafted documents on the role of libraries in supporting Canadian studies, and the need for a national microfilming project, better known to us as C.I.H.M. [Canadian Institute for Historical Microreproductions], on whose Board of Directors he also served. I first felt twinges of the mania when as a graduate student I discovered western materials I never dreamed existed, and my case worsened when my supervisor suggested the need for a regional bibliography. I might have recovered from the mania without any permanent impairment, had it not been for an invitation to tell an undergraduate English club about materials which prospective regional writers might exploit. And so I started writing titles on the backs of used catalogue cards and filing the cards in a shoe box … [and soon] I was hooked on the habit of collecting titles. My intention was to have a bibliography compiled in a matter of months. In my blissful ignorance I assumed that most of the literature of the West was contained within the walls of the University of Saskatchewan Library. Now, after many years of searching through major libraries on this continent and in Europe, I admit that I probably have not yet rounded up that last title. "… a priceless tool for all students of prairie history and literature and a fascinating compilation through which to browse." It contained 2,769 numbered items. In 1963 a 130-page Supplement was published, which added a further 475 titles. "Why are the titles relating to the Prairie Provinces so elusive?" Peel asked rhetorically in an essay entitled "In Quest of the Elusive." [Papers/Cahiers of the Bibliographic Society of Canada XIV (1975): 7 et passim] [Because] "Many [prairie] publications were ephemeral by nature. Perhaps few other regions of the world have had such a high percentage of early descriptive publications intended for the perusal of persons outside the region; I allude to the scores of immigration pamphlets." And, he might have added, the later ephemera endlessly churned out by the Canadian Pacific to promote immigration and tourism. "Further, until recent decades there has been a paucity of local library and archival depositories in the Prairie region, where Prairie titles might be expected to repose. Even if a library has regional pamphlets, these were likely to be in dusty storage, unappreciated and uncatalogued." The task of rising to these challenges falls naturally to a bibliographer, and – somewhat unwittingly – Bruce Peel devoted a large portion of his life, industry, and prodigious energy to addressing them. "… for they collect not the corporeal, but only the whiff of its essence. To psychoanalysts the bibliographer is basically a bibliophile who, too poor to buy books, finds a outlet for his frustrations by copying book titles on scraps of paper. Yet I like to think that these eccentrics are also preservers of our cultural heritage." "A bibliography is more than a record of books; it is a record of the people who wrote and published. Some prairie poets might have better ended up mute, inglorious Miltons in country churchyards, than to have published their literary remains. But I feel sympathy, nay affection, for all these people who expressed such creativity as they had … in the preparation of a book or a pamphlet. And they owe me something too, for by my record the names of many have been preserved from oblivion." "It has pleased me to contemplate that western Canadian author entries in library catalogues, perhaps all over the world, are more complete because of my searches. This is psychic income – and being untaxable, is all the sweeter."